Welcome to Disability Resource, Inc. 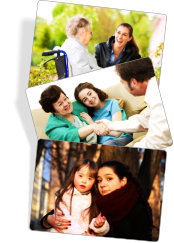 Disability Resource, Inc. is a MENTAL HEALTH CERTIFIED, Home and Community Based Service provider licensed under Chapter 245D of State of Minnesota Department of Human Services. We offer individuals with options for supported living services that allow them to live in their homes as independently as possible. The point of the services is to avoid institutionalization. Individuals should have the right to live as they prefer and as independently as they can with their health situation or intellectual capacity. Support services provided through Disability Resource, Inc. ensure that the needs of individuals with physical, developmental and intellectual deficiencies are appropriately addressed with dignity and respect. We habilitate them into the community they belong to. We give them alternative living opportunities so they can stay close to their family members and supported to lead meaningful lives. "It is the philosphy of Disability Resource Incorporated (DRI), That all individuals, regardless of disability, have the right to the opportunities of community intergration, participation and presence."